The Motorola Moto G4 Plus was a phone of 2016, featuring good specifications for the price and a superb camera. The company rolled out the Android Nougat update in November 2016, and it’s been more than a year since the phone received any more Android update. Yes, the Moto G series phones usually receive just one Android update in their lifetime but for the G4 Plus, the company has promised the Android Oreo Update that we can expect after some more months. 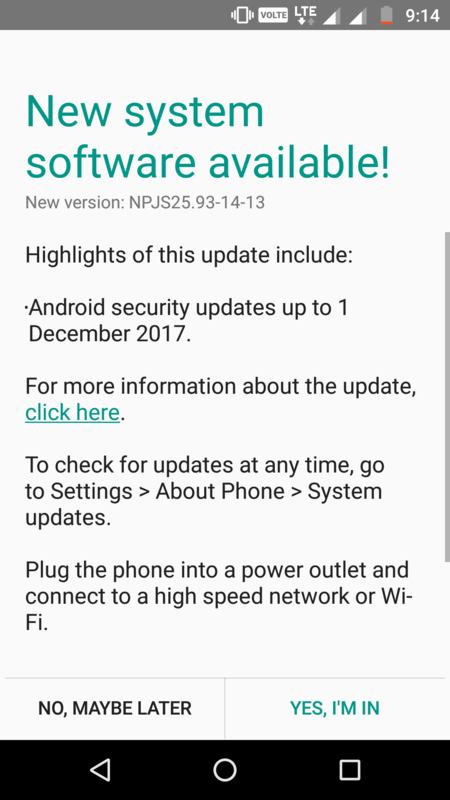 The phone has started getting a new update in India that brings December Security Patch to the phone. Coming with the version – NPJS25.93-14-13, the update is about 35MB in size, and this shows that it is a just a Security Patch and nothing else. Almost every user of Moto G4 Plus might have received the update so far but if you didn’t get the notification of this new update, just head to Settings > About Phone > Software Update. There, you will get the new update and just Install it. Make sure that you have sufficient battery on the phone so that no problem occurs while the update is being installed.